Make sure your hives have plenty of water. As soon as you take honey, start feeding your bees so they store a lot of food for winter. Colony treatments can also start right after you take honey. Get those Varroa counts down low! The temperatures are slowly creeping back up and the days are getting longer. More and more we are seeing activity from our hives now. The bees having been bringing in a lot of yellow, orange, and cream colored pollen. Continue to stay vigilant to the food stores. Remember, there’s still not that much nectar forage out there for them and we know this time of year can bring many days of rain. Feed any hives that you feel need it until you see plants blooming and days of sunshine. With the days growing longer, the queen steadily increases her rate of egg laying and the drones begin to appear. More brood means more food consumed. As temperatures rise you can begin feeding syrup rather than dry feed. But be careful, because once you start the Queen will increase her egg laying and you will need to continue until there is plenty of forage as there will be more mouths to feed in the hive. Remember as you feed syrup, you stimulate the queen to increase egg laying in the early Spring… sometimes more and faster than you want… which results in swarms the latter part of April or early May. Continue to check for food stores by hefting/lifting the backs of each hive to feel the weight. You should be able to start feeding syrup to those that are low on stores. Clear the entrances of dead bees. Check your equipment for the upcoming season. Buy your equipment; 2 deeps or 3 westerns (with bottoms and lids) for the bees home, bee jacket, hive tool, smoker, and feeder. Enduring the cooler weather and rain for the last few months doesn’t get my blood flowing, but today was a beautiful day and it gave me hope to what lies just around the corner. My bees were flying out of their hives and all over the heather in the yard. I even noticed a couple with some small amounts of white pollen. Just the kinds of things I needed to see to ease my impatience for the upcoming bee season. We are heading into the final weeks where some hives will run out of food. Check your hives and give them that little extra boost if they need it. It won’t be long now before the crocus’s begin to bloom. Pick a nice day and clean out any dead hives you had this winter season that may have died out. You should always clean your hive tool between hives so you don’t spread disease to another hive. A simple paper towel with rubbing alcohol helps and makes quick work of propolis buildup on your hive tool. On a sunny day sit beside your hive and watch the bees. You can learn from just watching them at the entrance. See if you notice any bees with pollen coming in. Inspect the exterior of our hives, their entrances, flight paths and monitoring trays; as they are still our best sources of information about our colonies in the winter. Hopefully, your bees are still alive and well. If you’ve been lucky, you’ve gotten to see your bees come out and buzz around a bit on the rare warmer days. If you haven’t seen any signs of your bees and need some reassurance just place your ear against the back of the box and listen. If all is well you’ll hear the soft hum of bees as they cluster to stay warm. Just 2 ½-3 more months before we begin to see consistent activity. Lift the back of the hive to check the weight. Compare hives of similar size. If one of them feels lighter than the others then perhaps it’s time to feed them to ensure they make it through winter. Check the hive entrance for blockage from the buildup of dead bees, snow or ice. Read a good book on beekeeping. If you need bees, now is the time to start ordering for arrivals in April-May. Build and repair equipment for the upcoming season. On the rainy cold days start looking through bee catalogs. What went well last year and where did we go wrong? It’s time to start thinking about what we might want to try this year; perhaps queen rearing, making a Nuc or focus on honey production methods. Depression begins to set in now as we begin to realize we must wait about 3 more months before we get to fiddle with our bees. To help stave off this dilemma, go out and look at your bees (at the entrance) on the warmer sunny days to see what’s going on. Sometimes its orientation flights, sometimes they even bring in pollen. The bees have hunkered down for the winter. Not much activity from them except on the occasional warm sunny day. Keep entrances open/unclogged (dead bees, snow, ice). You may notice some die-off at the entrance or on the ground. This is normal in small amounts. If there are larger quantities over an extended period of time keep an eye on the hive (intervention is very limited). Ventilation. If you are using something to prop the outer cover (telescoping top) for ventilation purposes look at the underside occasionally for mildew/moisture build-up (do not pry the inner cover off. There’s no reason and you only disrupt the bees). If you notice a lot of moisture/mildew building up then increase the ventilation a little more until you find the gap that seems to work. The underside of the lid does NOT have to be completely dry as a little moisture will accumulate with temperatures change, etc. You just don’t want it dripping wet/covered in black mildew. 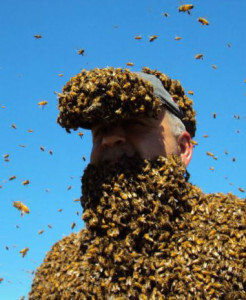 Remember, bees can handle cold. They can’t handle wet and cold. If you like the idea, you can use Styrofoam boards under your hive lid to help keep the colony warmer. But make some sort of ventilation hole in the foam for moisture to escape out. Setup a wind break if necessary if winds are bad at your hive location. Store your equipment away for the winter. That means cleaning it up before you do so you reduce unwanted pests in your storage area. If you use your garage you may want to repaint items that need it so you don’t have to scramble during swarming season. Review how things went this past year, read bee books and attend bee club meetings. Wow, summer is over. Our bees should be tucked away for winter, and now we fight the depression that begins to set in as we have to wait 5 months before we can have fun again. Hopefully you got some honey and learned a lot not only from your bees, but from others within the club. If you kept any type of record, now is the time to review what went right and what went wrong while it is still pretty fresh in your head. Maybe even come up with an early game plan for the next bee season on what you want to try and what you want to make sure you don’t do. Feeding sugar syrup should stop, since the bees won’t have enough time to ripen and cap the syrup. This just adds to the moisture in the hive and isn’t a good practice in the winter in our wet climate. If your hive feels light (lift the back up slightly to “get a feel”) consider giving them a candy board or fondant as supplemental feed. Plain old sugar works too in emergencies. Do a last check to make sure you haven’t overlooked something in your apiary that needs to be fixed, ie: you left on a queen excluder, haven’t reduced the entrance, or put on mouse guards (if that’s an issue in your area), and some type of ventilation. Remember, bees can handle cold …not damp and cold. Mite treatments should be completed and remnants removed. Don’t procrastinate. There’s no real need to open the hive just to look unless you suspect a serious problem. It’s getting cooler and you don’t want to break the inner cover/lid seal if you don’t have to, because the bees have weatherproofed everything. Configure the hive for winter with attention to ventilation and moisture control. It’s really pretty simple to do. Consider putting up a temporary wind break for the winter if you have wind issues at your hive location. Clean and store your equipment away for the winter. We’re in the final stretch of hive preparations to ensure our bees make it through winter. If you have procrastinated the odds may not be in your favor come spring. The cooler nights are here and when the rains finally show up we all know it wont stop ’til spring. The bees don’t have a lot of time to get empty frames filled with winter stores. As you feed and they start to slow down taking syrup keep an eye on what they have accumulated and make plans to supplement their feed during winter if necessary. It’s always better to feed if unsure. You may begin to notice feelings of depression. This is normal for beekeepers when we realize it’s the end of the season for our bees and we begin to tuck them in for winter. Fill your head with thoughts of packed hives in early spring to help you cope. If we’ve done a good job and paid attention to them we’ll see them again in early spring ready to go to work. Do they have sufficient stores? If not, continue feeding 2 (sugar) to 1 (water) syrup until they wont take it any longer or your upper deep is full. (westerns upper box is full, middle has about half the frames filled with honey). They should also have pollen on some frames… if not, consider giving them a pollen patty. Check to ensure your hive is queen right. If you see eggs, your queen was in the box recently (last 3 days). You do NOT have to see the queen then. Hive population has been dropping (drones have disappeared) and you may have noticed recently some hives had no eggs or brood. This is normal as the queen does shut down at times but not all hives are the same. Any sign of disease? Look at the larva and capped brood. Last chance for treatments so treat if needed. Mite treatments should be done or getting pretty close to being done. Don’t forget to pull the strips or medication as required per the manufacturer. Entrance reducer? Put on an entrance reducer. The yellow jackets, hornets, etc. have been out harassing our hives. Consider adding some type of upper ventilation/entrance (small shims, popsicle sticks, etc.) to allow a little ventilation to reduce the moisture from the syrup your feeding, keep moisture from building up in the hive and to allow bees to escape should the bottom entrance get clogged with dead bees, snow, etc. during the upcoming winter months. Bees can handle cold…but not wet and cold. Don’t keep the hive completely sealed up with only a bottom entrance…ventilate. Winter preparation is usually done after the removal of the last honey crop of the year, so if you haven’t already started to get your bees ready for winter, you need to get moving if you want them around next spring. We have several weeks left that allow the bees to put away nectar and pollen. Weather can change quickly and hinder the times we have available so don’t put it off. Our goal is fat, happy bees with plenty of food, no disease and a good fall population in each hive. The hard work is almost over. Let’s make sure we take good care of our girls. Make sure your hive still has a queen (eggs or young larva). If you didn’t like how your queen performed, then now’s your last chance to replace her until spring. Continue to check for signs of disease, high mite levels, etc. and treat as necessary. Feed hives sugar syrup (2 sugar to 1 water) if they need it. If you are using deeps (2 high), you should go into winter with the upper deep filled with honey (10 frames). For westerns (3 high) the upper box should be full as well as at least 6 frames in the middle box. Use entrance reducers to help thwart off yellow jackets, hornets, etc. if they are harassing your hives. Remove queen excluders! If the excluder is left on, the queen will be confined below the excluder and will not be able to move up with the bees as stores are consumed. Unite weak colonies. You can always split them in early spring as they build up. Make sure the hive is slightly higher in the back if you are using a solid bottom board so water (from rain & snow) and moisture within the hive is able to drain out.